October | 2010 | IXA Ready - Fist On! Today had a slight drop in sales figures which saw Beginner sell 23,191 copies. Unfortunately it wasn’t enough for the single to break through the 800k mark but I’m sure that’ll easily be done tomorrow. The grand total now stands at 791,295. 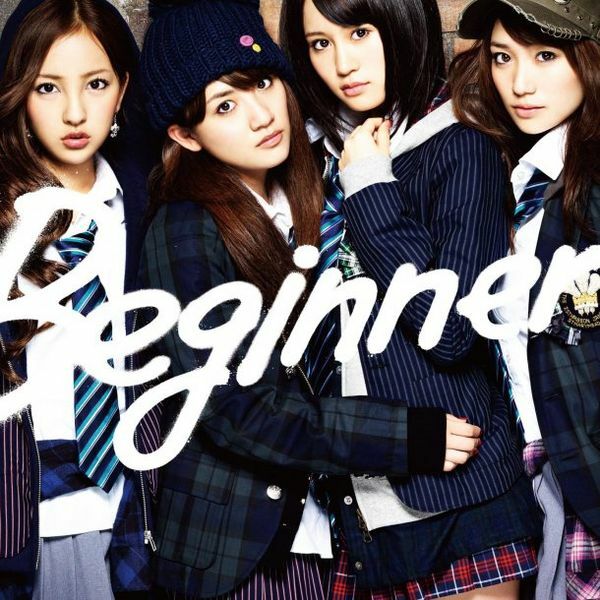 Here’s a performance of Beginner on Music Japan below. I’ve noticed that Miichan has been wearing glasses for some promotion appearances for Beginner. Has she got a problem with her eyes? She looks great with the glasses! I’m a bit late in posting the 4th day sales figures! Saturday saw another large drop but still good enough to hold onto the no.1 spot in the daily charts. 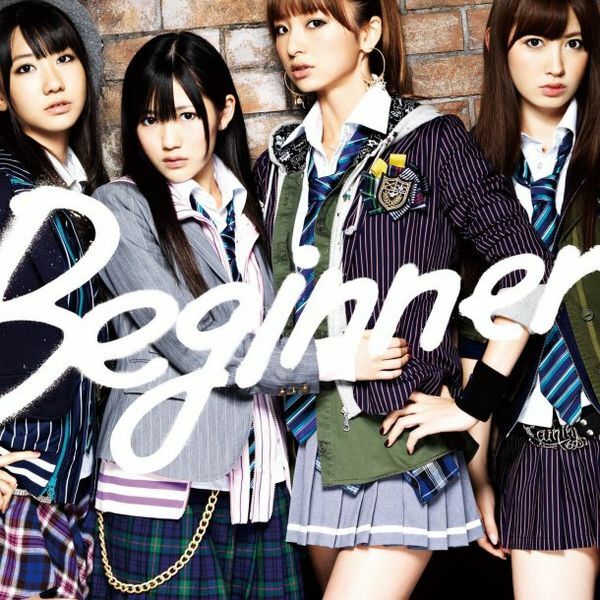 They sold an extra 26,077 copies to push Beginner’s grand total up to 768,186. I hope sales will improve a little bit tomorrow for the single to crawl over the 800k mark. 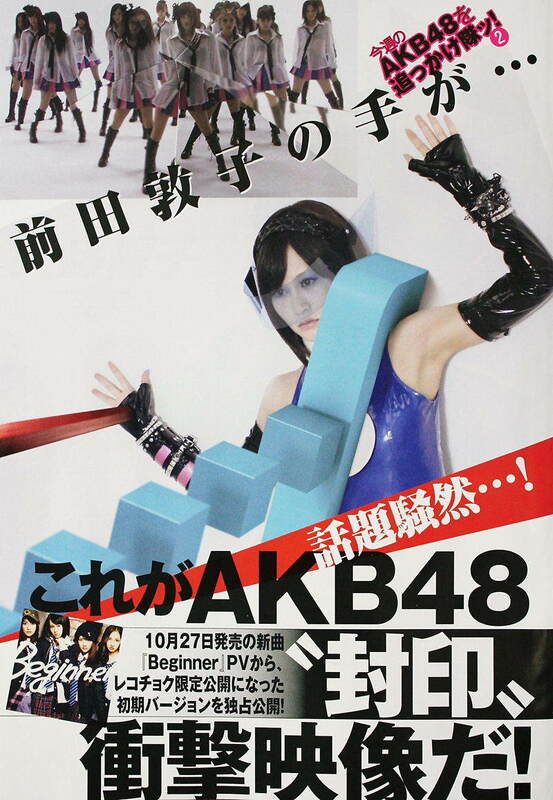 AKB48 Beginner 3rd Day Sales – It’s Official! Highest Selling 2010 Single! It only took them 3 days but finally AKB48 overtook Arashi at the top of the pile and became the highest selling single of the year. There was another dip in sales figures today- they sold 61,863 copies to bring the overall total at 742,109. I think 800k at the end of the first week looks possible now. Well done AKB48!! I finally had a chance last night to look at the censored Beginner PV. I couldn’t look at it on Tuesday and Wednesday due to Youko’s region lock which I found pretty annoying but I managed to find another alternative. I loved the PV itself. OK, so it’s a bit violent but as other fans have pointed out AKB48’s target audience isn’t kids so I don’t agree that changing the PV was a wise idea in the end. They should have stuck with it. I’ll state the rules once more in case there’s somebody new watching the game for the first time. The object of the game is each of the first 5 girls in the team has a burger on a moving conveyor belt flip open to reveal a certain object. They must say something in 5 seconds that associates with the object without actually revealing what it is. The last girl at the end should manage to guess what the object is with all the clues that the rest of her team have given her. Round 2 of this stage and Sata’s team gets it right once more. I’m not sure what the correct answer was – it sounded like Sae said Fukugawa Yuki? Kiyoto’s team also got theirs right with the answer being Takamina. 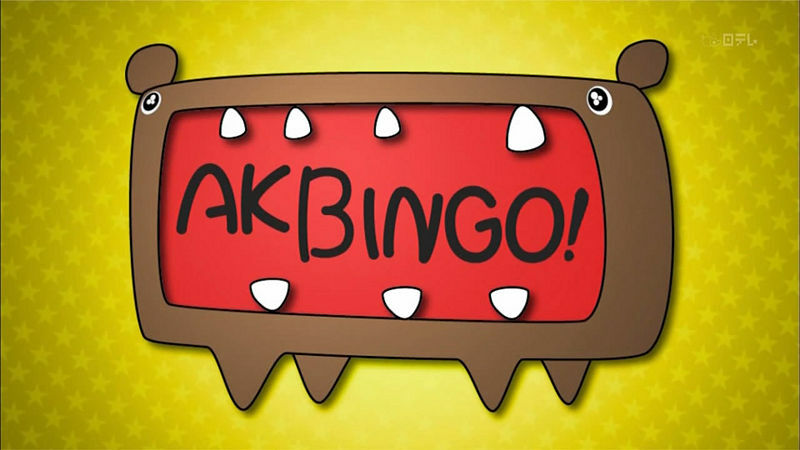 No episode of AKBingo is complete without some Takamina ribbing!! Round 3 sees Sae on a roll getting all 3 of her answers right. This one being “monomane” I think. At the half way stage of the game the Boss Burger Team is 3-2 up! 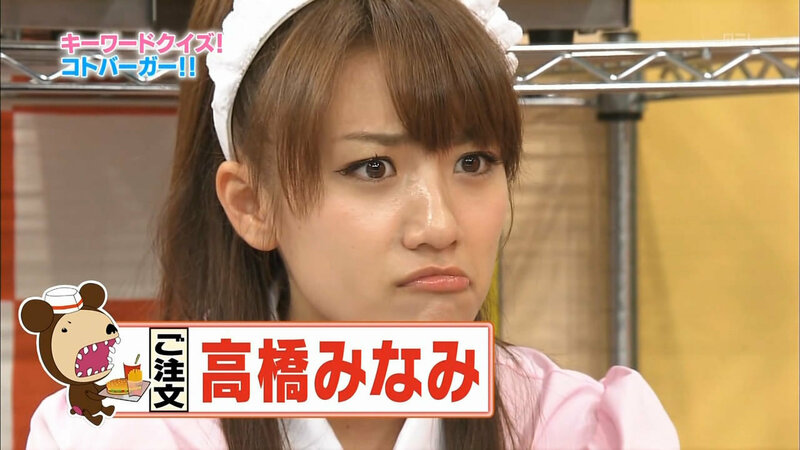 Round 1 – Takamina got her answer right which was a hot air balloon. Sata’s team with Yuko answering also got theirs right which was “okosama lunch”. Round 2 – Takamina got her 2nd picture correct which was a “catcher” but this is the moment in which the game turned in Kiyoto’s team favour with Yuko getting her answer all wrong. It was funny seeing her facial expressions trying to guess who was in the picture drawn. She guessed Santa Claus but it was in fact the samurai Saigo Takamori. The statue of him walking his dog stands near the Southern entrance of Ueno Park. You can’t miss it in the park! Round 3 – Mayu came to the rescue of her team with her great drawing skills as Takamina correctly guessed Mona Lisa as the answer. I don’t think she would have got the answer right if it wasn’t for Mayu. Phrasemuseum is between Acchan and Miichan. No surprises in that Acchan won! 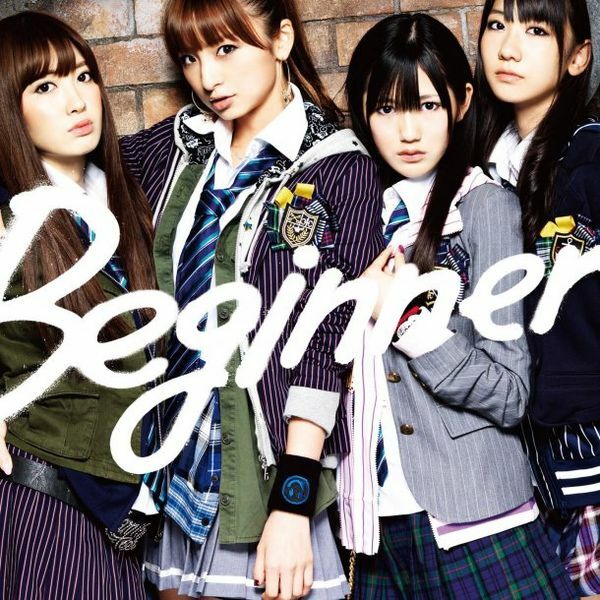 To end the show we’ve got a live studio performance of Beginner with Tomochin in the centre. It’s the same as last week basically. And that’s it for this week. More Muchaburi Dodgeball in the next episode. Can’t wait for that. There was quite a big drop in sales figures for the 2nd day and I thought they’d overtake Arashi as the biggest selling single of the year but that failed to materialise but there’s always tomorrow for that to happen. It was still quite an impressive figure considering so many copies were sold yesterday. The figure was 112,151 bringing the overall total up to 680,246. I guess it’ll be tomorrow when AKB48 will break through the 700k barrier for the 1st time. The figures are finally out for the first day sales of Beginner and it far exceeded what I thought it would be – the figure is in fact 568,095!!!! It has destroyed AKB48’s previous best by a long shot (Heavy Rotation sold 340,487 on the first day) and who knows what the final total for the 1st week will be? The single will definitely be the biggest selling single of the year and that there is no doubt. Congratulations to all the girls. I’m sure they’re all shocked by how well the single has sold today. All eyes will be on tomorrow now and how well they do on the 2nd day.